That is a very common saying among Pakistanis. In the literal sense it means “chicken made at home is equivalent to lentil” and I don’t need to get into what it implies. What I will get into is that the same term of ‘endearment’ can also be applied to Pakistan’s test team. Ranked number 3 in the world, unbeaten in the UAE, second best W:L record among all test teams since October 2010, second best W:L record among all test teams at home since October 2010, second best W:L record among test teams away since October 2010. All of this without playing a single test in Pakistan. Yet for a lot of the fans and critics, it is not enough because Pakistan win at home, which really isn’t home but it is the UAE. For some illogical reason a win in Australia or England is superior to a win in the UAE. Pakistan’s test team under Misbah has done what no other test team from Pakistan has done. 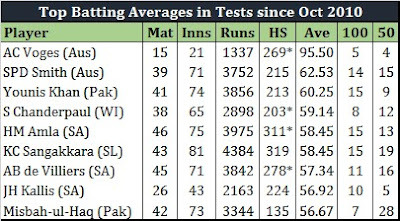 They have won more tests under Misbah than under any other captain. They have beaten all nations that have toured the UAE. They have climbed the rankings like never before. And their batsmen and bowlers have created records like never before. The one thing that has been missing from this great test team is victories in Australia and in England. It is unfortunate that the team has not toured either nation in the past 6 years. However, it makes for a great story - the final frontier for a team that has achieved so much in what could be Misbah’s final year in international cricket. The past 6 years has seen Pakistan become one of the best test teams in the world. Under Misbah they have conquered all. What remains is series wins in England, something that no one has achieved since Wasim Akram’s team 20 years ago, and in Australia, something that no one has achieved ever. It truly is the final frontier for Misbah. Australia will happen later in the year; right now it is all about England. Pakistan are back in England after 6 years since that ill-fated tour in 2010, because of which Misbah became test captain. Little did we know that 6 years later he would be the most successful test captain in Pakistan’s history. Back then it seemed like a stop-gap arrangement for a team that had lost captains, senior players, and all of its integrity. Now he is the leader that has given Pakistan a serious chance to beat England in their back yard for the first time since 1996. Over the years the wickets at Lord’s, Oval, and Old Trafford have become conducive to batting. High scores have been posted here regularly and spinners have played a bigger role in matches than seamers, especially in the later stages of the matches. Three of Pakistan’s four tests this summer will be at those venues, and one can count on Yasir Shah to be a handful. Since the fall of Saeed Ajmal, Yasir has fast become Pakistan’s leading spin option. Yasir has been exceptional against all teams and his wicket taking ability resulted in the record of reaching 50 test wickets faster than any bowler ever for Pakistan. Yasir is among the few bowlers who have managed to capture 50 wickets in less than 10 tests; he is among the only 6 spinners who have achieved this feat; and he is the fastest leg spinner to the feat equaling the achievements of Arthur Mailey and Stuart MacGill. 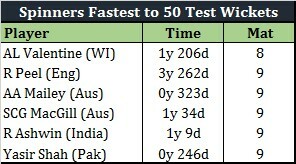 In terms of time, no one has done it faster than Yasir. Yasir has shown why Shane Warne keeps saying that he is the best leg spinner in the world today. Since his debut for Pakistan in October 2014, he is among the leading wicket takers in the world; behind only Nathan Lyon and Stuart Broad, both of whom have played far more tests than Yasir has. While Pakistan’s series victories in England in 1992 and 1996 are more popular for Wasim and Waqar’s toe crushing yorkers and the havoc they ran among England’s batsmen, the guile of Mushtaq Ahmed played as big a role in those wins as the 2 W’s lethal bowling. Yasir will undoubtedly play a major role in the upcoming series and he, along with Aamer, can potentially recreate the bowling and the eventual series wins of 1992 and 1996. He has been a revelation for Pakistan at number 7 and a key driver of the team’s success in tests for the past 2-3 years. Not only has he transformed into the best wicketkeeper batsman Pakistan have ever had, he has been the leading wicketkeeper batsman in test cricket for the past 2-3 years. He has scored more runs, more centuries, and more fifties than all other wicketkeepers during this period. One of the main reasons why Sarfraz has been able to make such a big positive impact is his strike rate. Not only does he score more runs than other wicketkeepers, he scores them faster. His numbers in tests are just mind blowing. Sarfraz has taken full advantage of bowling attacks that have been tired out by Azhar, Younis, Misbah, and Asad to drive home the advantage for Pakistan. He possesses all the tools required to take the game away from the opposition very quickly and is a game changer that England will need to be wary of. Hailed better than Wasim Akram at the same age, Mohammad Aamer is undoubtedly one of the best pacers to be produced by Pakistan. Unfortunately, his career hit a roadblock 6 years ago at Lord’s; however in less than 2 weeks, Aamer will resume his career at the same venue. Call it karma, call it irony, call it what you may, no one can deny the fact that Aamer is the most skillful fast bowler in cricket at the moment. Last time Aamer was in England he picked up 19 wickets in 4 tests and won the Man of the Series award for Pakistan. Before those 4 tests, he had tormented the Australians over 2 tests in England. Those spells during that summer in 2010 were one of the best fast bowling spells I have ever witnessed in test cricket. If Aamer can produce anything similar then Alastair Cook and company are going to have a very torrid time at the crease. The most successful captain in Pakistan’s history has also scored the most number of runs as a Pakistan captain. Not only that, but in the past 6 years he is among the leading run scorers as a test captain and also boasts one of the highest batting averages as test captain. His 7 test centuries during this period includes the fastest century ever scored in a test match, a record that he jointly holds with Sir Viv Richards. If anyone can lead Pakistan to their first test series win in England in 20 years, it is Misbah. He has done it already, marshalling his troops to 5 spectacular test wins over England in the past 4 years, so he knows what is required. The venues might be different, but the tactical nous that Misbah possesses and the advantage he has over his counterpart is stronger than many think. He has scored more runs and centuries for Pakistan in test cricket than anyone else. Not only has he arguably become the best test batsman produced by Pakistan, he is also among the best test batsmen in the world at the moment. In the past 6 years, since Misbah has been at the helm, the world has seen Younis at his peak. Pakistan’s batting mainstays, Younis and Misbah, have been among the best test batsmen in the world during this period. The last time Younis was in England, the world witnessed a monumental innings of 170 odd. He has the backbone of Pakistan’s batting in every test series he has played in and it will be no different this time. Becoming Pakistan’s highest run scorer and his march towards becoming the first Pakistani to score 10,000 test runs have added more fuel to Younis’ already burning desire to be the best. He is at his peak and England are going to find it very tough to remove him from the crease. 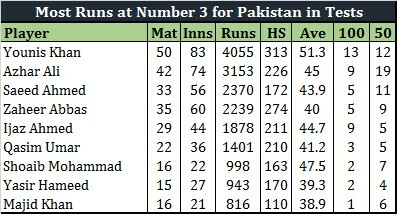 A batting average of 43 is dwarfed in front of the numbers that Misbah and Younis have mustered over the past 6 years; however Azhar Ali has more often than not proven that he is among one of the best number 3 batsmen Pakistan have ever had in tests. Since Azhar’s debut in England in 2010, he is Pakistan’s second highest run scorer in tests, behind only Younis. 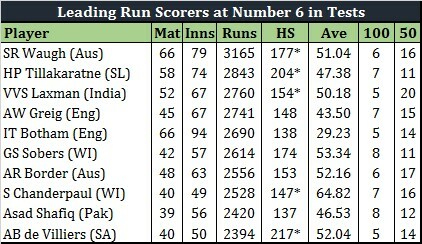 During this period he has hit 9 test centuries; only Younis has hit more for Pakistan in this time. Just because he had a mediocre tour of South Africa a number of skeptics believe that Azhar will be a sitting duck in England. These skeptics have probably forgotten that Azhar’s debut series was in England and his 50’s against Australia and Lord’s and Leeds coupled with his unbeaten 92 vs England at the Oval showed his mettle. He is a far more accomplished batsman today than he was 6 years ago. There is no doubt in my mind that this will be the tour that will transform Azhar from a good test batsman to a world class one. Along with Azhar Ali, Asad Shafiq has also been a key component of Pakistan’s middle order in tests that has transformed the team into world beaters. Not only is Asad the most prolific number 6 Pakistan has ever had in tests, he is also one of the most prolific number 6 the world has seen. Asad’s 8 centuries at number 6 equaled a record held by Sir Gary Sobers for over 40 years; one more ton and Asad will have the most centuries at number 6 in tests in the history of the game. Skeptics again will say that Asad has played mostly in batting paradises of the UAE and is yet to be tested in seaming conditions. For all of them, I will only ask to refresh their memory and rewind back to Cape Town, February 2013 and remind themselves of that magnificent century against the world’s best bowling attack of Steyn, Philander, and Morkel. The series gets underway in two weeks and Pakistan have their best chance to win a series in England for 20 years. They also have the added advantage of playing 3 of the tests on batting friendly pitches and a 4th one at a venue (Birmingham) that will have more Pakistanis cheering in the stands than the British. Pakistan’s test team has created a fortress in the UAE; ironically enough they will find more support at the grounds in England than they have in the empty stadiums of the UAE. Just this fact will further motivate this lot, who have been starved of home crowd support for over 7 years now.